717 Nicollet Mall / 80 So. 8th St. The IDS Center includes the Marquette Hotel, an annex on Marquette Avenue, a 2-story retail section, the Crystal Court, and its most prominent component, the 57-story steel and glass IDS tower. At 775 feet-6 inches, the tower has been Minnesota’s tallest building since it was completed in 1972. The tower’s signature zigzag profile (architect Johnson called the tower’s exterior folds “zogs”) creates a series of dark and light vertical bands and allows 32 corner offices on each floor. The opening sequence of the landmark 1970s television series The Mary Tyler Moore Show includes several shots of Mary in and around the IDS Center, and her famous hat-toss, memorialized now in sculpture, was filmed across the street. The tower’s original anchor tenants were Investors Diversified Services, Inc. (now Ameriprise Financial) and the Dayton-Hudson Corporation (now Target Corporation), though the building is now the office home to several prominent law and financial firms. The multi-award-winning Crystal Court connects the other four buildings. 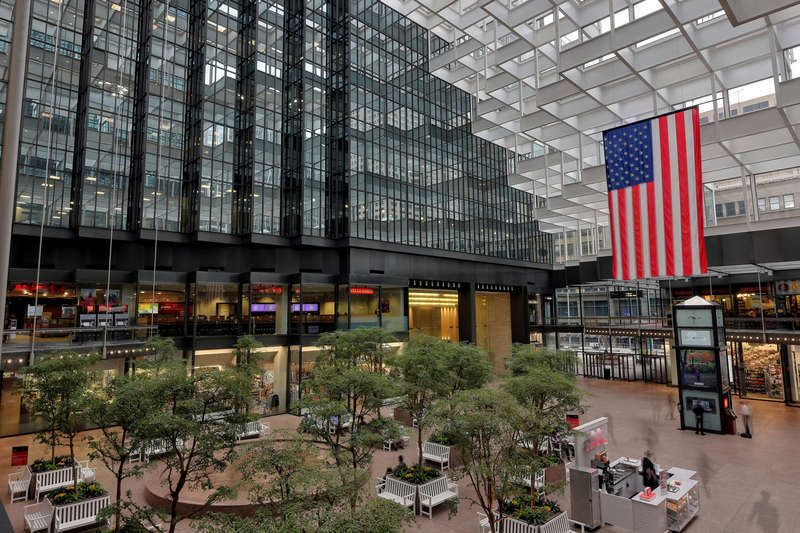 Architects Johnson and Burgee, who were primarily responsible for the complex’s design, envisioned the Crystal Court as Minneapolis’s town square, and the soaring space, containing restaurants and public seating, has often fulfilled that vision. In the 1998 renovation by the HGA architecture and engineering firm, a quietly splashing 121-foot water fall and a grove of olive trees were added. The Crystal Court’s ceiling is a complex expanse of stepped clear glass cubes. 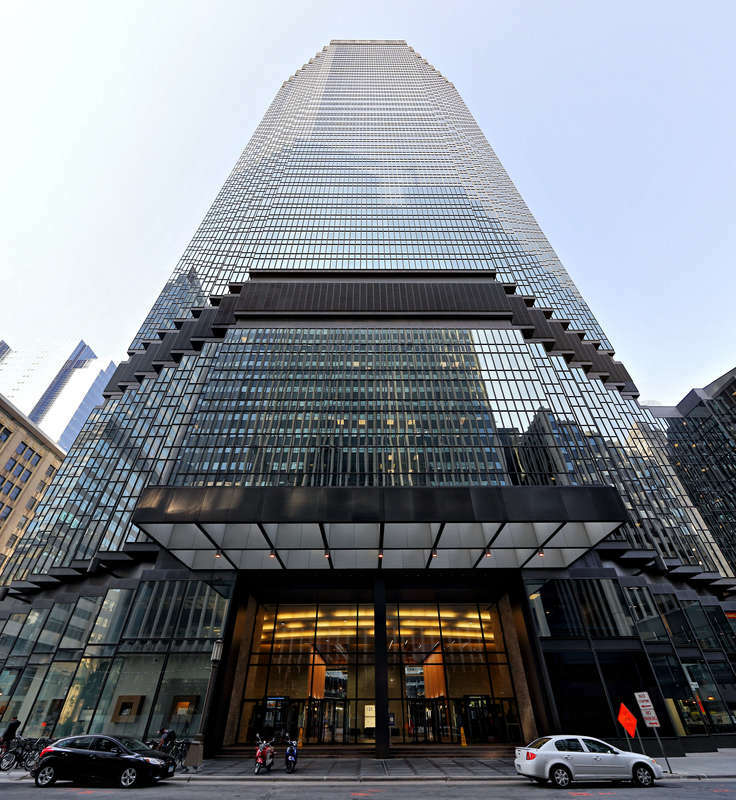 The IDS Center is a prime example of the International Style, characterized by simple geometric forms, an emphasis on functionality, and a lack of ornamentation. The French architect Le Corbusier famously said a house should be a “machine for living in.” The IDS Center is a machine for working in, and nearly a half century after its construction, its clean lines remain a symbol of the city’s pragmatic aesthetic. Richard L. Kronick & Lisa Middag, “IDS Center,” Minneapolis Historical, accessed April 18, 2019, http://minneapolishistorical.org/items/show/161.